Sept. 13, 2012 (COLUMBIA, S.C.) – On October 2, 2012, Executive Chef Tim Peters of Motor Supply Co. Bistro in Columbia, S.C. will once again join Executive Chef William Dissen’s all-star culinary team for an Outstanding in the Field dinner in Asheville, N.C.
For the fourth consecutive year, The Market Place’s Chef Dissen will host the mobile restaurant, a national initiative which returns for 2012 to Gaining Ground Farm just outside of Asheville in Western North Carolina. 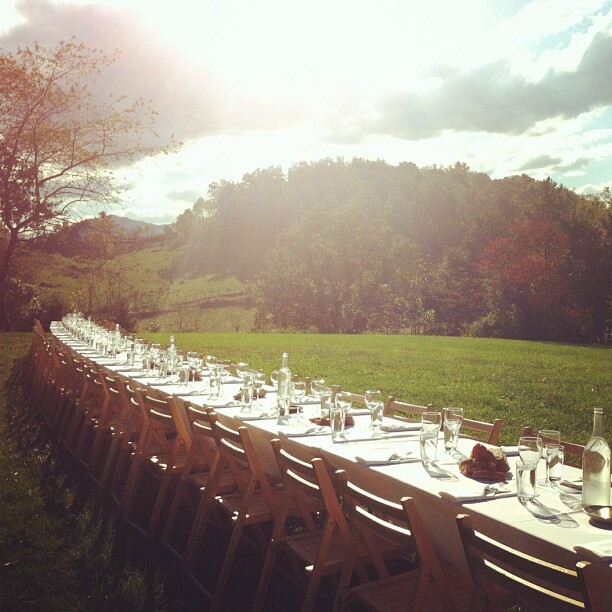 With the mission of reconnecting diners to the land, the event brings together a superstar team of chefs from the region to create a memorable meal on the farm, always served at Outstanding's signature long, outdoor banquet table. Officially started in 1999, Outstanding in the Field aims to honor local farmers and food artisans around the country. A roving culinary adventure, the event evokes the feeling of a restaurant without walls. This will be the second year that Peters joins Dissen's team of star chefs. Farm-to-table meals are no new concept for Chef Tim Peters, who employs the same methodology at the Columbia, South Carolina restaurant Motor Supply Co. Bistro. With a la carte menus drawn up daily, Peters has created and sustained close bonds with local organic (and near-organic) farmers and celebrates their work with events like Harvest Week, the next of which will be held October 16 – 21, 2012 featuring Meet the Farmer Happy Hour on Oct. 16, 2012 from 5:30-7 p.m.
Notes Peters, "Cooking at Outstanding over an open fire for 150 people, using everything farmed from within a good day's walk of Asheville, brings joy to my heart because I get to see the farmers who raise what I'm cooking." He continues, "I also get to witness Bill Dissen, a great artist, bringing it all together, and I love being a part of it." "Plus," Peters notes, "I love it when someone in the outdoor kitchen asks, 'Chef?' and all of us raise our heads from the line to answer." "It's great for Tim to go out to other renowned food cities like Asheville and cook with his peers and friends," notes Motor Supply owner Eddie Wales. "He returns invigorated, which puts extra shine into his already-inspired ingredient sourcing here at Motor." Motor Supply Co. Bistro has been serving New World, made-from-scratch cuisine in the Vista since 1989 at 920 Gervais Street, Columbia, S.C., 29201. Reservations can be made by calling 803-256-6687 or by visiting http://www.motorsupplycobistro.com/reserve.